Spartacus with a Warrior unit and some lights outflanked the Roman right and killed my poorly positioned cavalry and Light Infantry while Crassus Double Timed into the leaderless Slave centre, followed by a Clash of Shields which took out a couple of Slave units, knocked another couple down to 1 block, sent S[partacus fleeing and looked like the end game.....except that I was completely unable to order my centre for the rest of the game! The Slaves took advantage and put me down 5 banners to 4. With no other option I was forced to assault the left flank hills with the advance force there, repositioning Marcius onto the Auxilia. Castus went for him in the hills and lost out and next turn I was able to occupy the camp with Marcius and the 1 block Auxiliary for an unlikely win. The game ended bizarrely with a bunch of scattered Roman Mediums adjacent to 1 block Slave units that they'd be keeping company with for the last 5 turns.....given the Slaves' inability to press advantage against my paralysis in the centre, I assume they had no centre orders either. An interesting, non-linear brain-burner of a scenario and a fun, close match that could have gone either way. Well played by Leonid. Edit: I didn't realise Leonid had already reported this, so this is a double up of the first match, Mark. Leonid, by convention the match winner reports, unless otherwise arranged, to avoid confusion. Last edit: 11 months 1 week ago by BrentS. 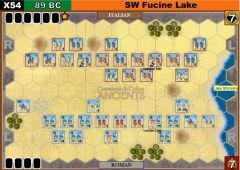 While the Slaves get into position the Roman lights inflict heavy casualties to Cannicus skirmishers and even completely destroy Spartacus light cavalry after it foolishly got its retreat path cut off by warriors and the Lucanian Lake. 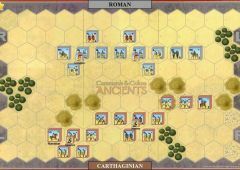 Castus takes the iniative and attacks Crassus centre force. The Roman riposte is hindered by the Roman light caught in the midst of the fight. 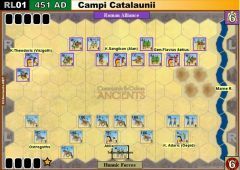 Castus forces manage to eliminate the Roman force but Crassus escapes but chooses not to flee and take the rightern forces to push back. 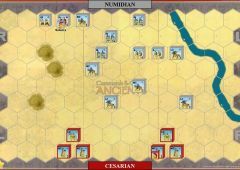 Castus suffers heavy losses and seeing that his contingents end is eminent goes for one last decisive charge in which they kill Crassus and an infantry regiment. A very different game to the first. 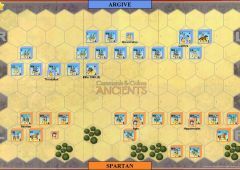 The Slaves had time to get Castus' isolated right flank units and a Warrior unit from their left to join Cannicus' force around the camp, closing the net around Marcius' troops. Too late they realised the danger and started moving but the slaves sprung the trap....all 4 Roman units killed for the exchange of a single Slave warrior and Marcius forced to make a leader escape through the hills.....which he survived! A Slave Light Cav which had been waiting patiently in the forest shot a 1 block Roman light which was sheltering on the Roman baseline. Crassus formed his lines and advanced toward Spartacus in the hills on the less threatening Slave left but in so doing his exposed left flank had to cross in front of the Slave camp, where Cannicus and Castus were reforming their troops. The warriors Double Timed into an unsupported Roman Medium and killed it, taking the last banner and routing the Roman army. Thanks to Leonid for a couple of very entertaining games and to Mark for choosing such an interesting scenario. Last edit: 11 months 5 days ago by BrentS. "Mark for choosing such an interesting scenario." - involved around 30 seconds thought prior to heading to work.. you're welcome..
Mark-McG wrote: "Mark for choosing such an interesting scenario." That is what they call "efficient decision making"
This scenario is usually decided on Marcius/Castus wing. It was like this also in that case. 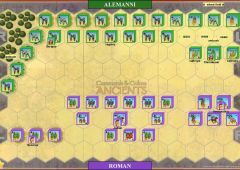 I managed to encircle Romans there and score full 5 banners not losing a one. That means that getting the last one was only a matter of time. Togan had awful cards (two MC, two Order Heavy) and I kept constant pressure on him so he really did not have time to free up his hand. Immediately after first game we initiated second one. Again, Marcius/Castus wing was crucial. Couple of initial moves were preparations for encircling and cutting to a piece the Romans in corner but I decided to change the momentum and attacked with double time. In the end I lost 4 banners there, but managed to take 3 for me, including Castus itself. Lucky Marcius escaped. 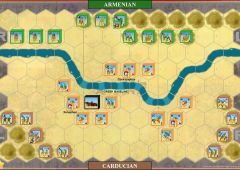 Then is was war of position and maneuver, which also due to some unlucky rolls of Togan I managed to in. 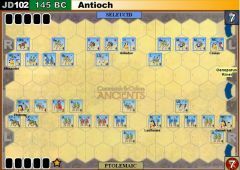 Two exciting games of very difficult (especially for Romans) scenario. Last edit: 11 months 3 days ago by mk20336. This battle played out in a rather typical manner. 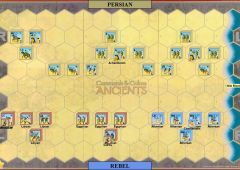 The battle began with a perhaps too confident attack on the Marcius forces. The Roman units in the north were finally killed off but managed to take with them 2 Slaves units and forced Castus to run off the battle field. Then the battle moved to the centre-right section were both sides gained banners in succession. Finally, the battle was decided by an attack of a single Slave light infantry unit on a lonely Roman general. This was a very unpleasant battle for the Romans. 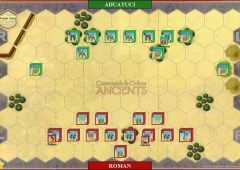 With a well-prepared attack in the centre the Slaves manged to obtain a very quick 4-0 lead leaving the Romans in a state of despair. But since in CCA every banner counts the Romans carried on: counter attacked in the centre dispatching two Warrior units and occupied the Slave camp in the north killing another 2 units in the process. At this point the result was 5-5. 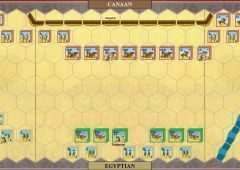 In the last turn the Slaves faced a dilemma: should they try to take back their camp or simply try to gain the final banner? Since taking camps is not at all straightforward, the Slaves went for the final banner and secured the victory. Due to a laptop crash we lost our only log file for this battle. Below you will find two .vsav files showing the location of our units in the last two turns. Many thanks to Mark for playing! I am terribly sorry to let you know so late but I cannot play this afternoon. I am also afraid I probably cannot go on with the tournament at all, so please accept my apologies"